Tommy Woodcock: Mr. Telford used to train that horse too hard. If I can get him 90% fit, his heart'll get him to the line. Dave Davis: The amount of faith you put in that heart of his, kid, it must be one hell of an organ. I stumbled on this movie having never heard of it...I'm glad I did! This movie is the "Rocky" of animal pictures. 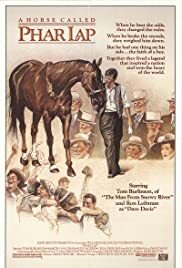 Based on a true story, it made me want to go and do a little research on the real Phar Lap. Your emotions will span the scale while you watch this movie. It doesn't have an all star cast...or even a recognizable one, but this movie is worth a rental fee or purchase.